Purchasing gasoline is a necessary evil for the average citizen. Unfortunately, oil companies don’t always make things simple for motorists when it comes to picking which gas to use. There are also rumors and misinformation out there that claim that using a higher octane gasoline like mid-grade or premium can save you money by making your engine run more efficiently. These claims are both true and false at the same time. Sadly, there is no catch-all answer on which gas is best for all around economics and performance. However, there are few things to think about when choosing the best gas for your financial and automotive situation. We put together this helpful list of things you should consider the next time you need to fill up your tank. What Does “Octane” Even Mean? Anyone who has been to a gas station has seen the often mysterious octane ratings listed on the pump. These numbers often include “87”, “89”, “92” and so on. However, it’s unlikely that everyone who comes across these numbers understands their meaning. The U.S. Department of Energy explains the octane ratio of gasoline as the measure of a fuel’s ability to resist “knocking” or “pinging” during combustion.” Knocking or pinging is caused by a premature detonation of the air plus the fuel mixture that gives automobiles their power to move. In other words, the higher the octane rating, the less likely your engine is to operate abnormally. Although you may be inclined to think that a higher octane rating is always better, there are other variables to consider when choosing the best type of fuel for your vehicle, as well as your finances. The best way to determine the best fuel for your vehicle is to check your owners manual for the octane rating that is recommended by your car’s manufacturer. For example, most vehicles are specifically designed to run on a lower octane rating like “87”. 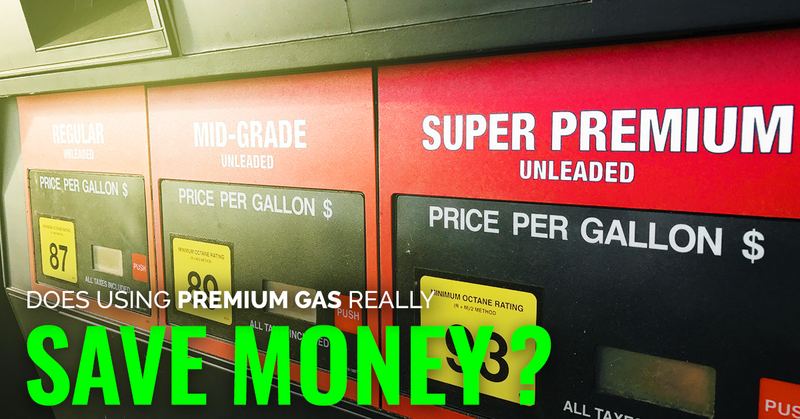 These cars don’t merit paying the higher cost of premium gas prices. So choosing the least expensive gasoline isn’t going to harm your engine or cause your engine to run less efficiently. But keep in mind that there are some high performance or luxury vehicles that are designed to run using higher octane fuel. These engines could very well be harmed over time and experience reduced efficiency that could cost the owner more money in the long run. Does My Car Need to be Serviced? Sometimes, car owners may experience a mysterious dip in fuel efficiency. Many people attribute this to a low octane gasoline which prompts them to begin paying the higher premium gas prices. However, that may be an incorrect assumption. The best course of action after a mysterious loss in fuel efficiency is to have your car serviced and bring it up to date with regular maintenance. It’s also smart to have the car looked at by a professional technician. While your vehicle could just need a regular tune up like a spark plug replacement, there could also be a more serious issue that requires immediate attention. Still not positive about what to do when it comes to improving your fuel economy? Then it might be time to call your local mechanic! Get in touch with the trusted car repair pros at Action Gator Tire to learn what you can do to get the most out of your vehicle.